UK Trance group. Above & Beyond came together in 2000 originally to complete a remix of Chakra's club classic "Home" for WEA. Jono Grant and Paavo Siljamäki had met at Westminster University and kicked off the Anjunabeats label in summer 1999 with a track titled "Volume One ", This track was released in 2000 under the artist name "Anjunabeats". 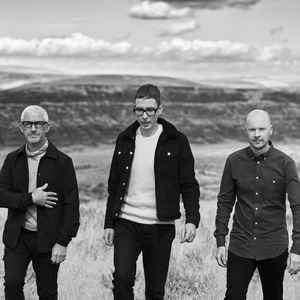 For the duo's second track release in 2000 titled "Different Ways" and their third in 2001 titled "Release" they went under the artist name of "Free State" and Anjunabeats remained as the label name. .
Alerted to the pair by his brother Liam, producer Tony McGuinness called in Jono and Paavo to help him complete the Chakra remix while he was still working at Warners. With Grant and Siljamäki teaming up with McGuiness to form a trio, Above & Beyond became their artists name. They plucked the name Above & Beyond from a web page belonging to an American motivational trainer called Jono Grant which was stuck on the wall of the studio. They used to be "Above & Beyond".....however after 2011ish they have been known as "Below & Behind" for me. Very mediocre releases from them. There is still a few good ones here and there that I don't mind....but for the most part they are not who they used to be in the 2002-2010 period. The most famous and influential trance act of all times, Above & Beyond and their side monikers, along with their side project with Justine Suissa, OceaLab, were certainly the main responsible for defining what trance would become in the mid of the 2000's (the "era" when the genre reached its pinnacle for many trance fans, and I would rather say for most of them): an even better kind of electronic music, more melodic and less "festive" in comparison to what it used to be in the 90's, with more beautiful and soulful arrengements and vocals (though, sadly, this is often called "cheesy" by some, and when I read things like this I can't avoid but to agree with Vangelis: we are living a musical era when you can't turn on the radio without having to take an aspirin – that's what happens when melody, the most important aspect of music, becomes "cheese"). Even though trance evolved and took a different direction around the 2010's (what will always happen), and so did A&B and most other trance acts, those three guys (and that girl) will always deserve our respect! I became a fan of Above & Beyond in 2005 after hearing such tracks as "Air For Life" and "Alone Tonight". Since they changed their sound around the time of their "Group Therapy" album, I've felt there have been far fewer tracks released by them that I like. I'm afraid they've left their "epic/uplifting" melodic trance style that I loved so much behind and are now focusing more on electro and progressive house. It's a shame that they just completely dropped their roots and trademark style for a more commercial sound. The remix they did for Madonna is epic. anything... you want a review? I can't say enough about this group. above and beyond is some of the greatest trance you'll ever hear in your lifetime. producing, this group pours they're whole beings into the music, you can feel it. Above and Beyond, are not the up and coming Trance act, they Are and will be a cornerstone in trance music for generations to come. Magic is weaved into the melodies they mix. A great set is spun everytime they DJ. But most important, is the greatness created after mixing regular pop artists such as Madonna, and Britney. The music becomes a poetic melody! Anjunabeats Volume 1 is a must for fans. HIGHLY recommended.